The Undersea and Hyperbaric Medicine Fellowship at SUNY Upstate Medical University is located at the only 24/7 Hyperbaric Medicine facility in all of Central and Western New York. Upstate University hospital is the only Level 1 Trauma Center and the only pediatric hospital in Central New York. The Upstate UHM fellowship is an ACGME-accredited program in good standing. It is the only program in New York State. 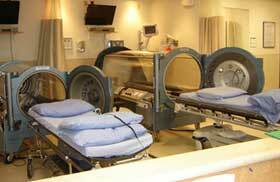 The fellow gains wide exposure to various indications for hyperbaric oxygen therapy. Upstate Medical University Hyperbaric Medicine supports regional and state public safety divers including the New York State Police Recovery Dive Team in Upstate New York. Upstate University Hospital is the only Divers Alert Network facility in all of Central and Western New York treating all dive injuries from the 2 nd busiest dive location in New York State on the St. Lawrence River, Lake Ontario, and the Finger Lakes. There is extensive experience in monoplace critical care. The fellow also gains experience in the management of problem wounds in the University Hospital Wound Care Center. The fellowship is overseen by 4 UHM fellowship trained, board-certified physicians. There is an extensive didactic experience that includes weekly patient teaching rounds, lectures, journal club, research, and attendance at national conferences. Upstate UHM fellow graduates have a 100% board pass rate and have gone into both academic and community practice nationally. Last Modified: January 18, 2019. Contact David Rothman with questions about the content of this page.